We have now successfully made it through the first week of classes! For the SIT program, we have a Spanish Exam at the beginning of the semester, in which our language level is determined. In this SIT Ecuador program, the Spanish instruction is done through a program called Experiment in International Learning (EIL). EIL has a staff of Ecuadorian professors who have Spanish instruction education and experience. 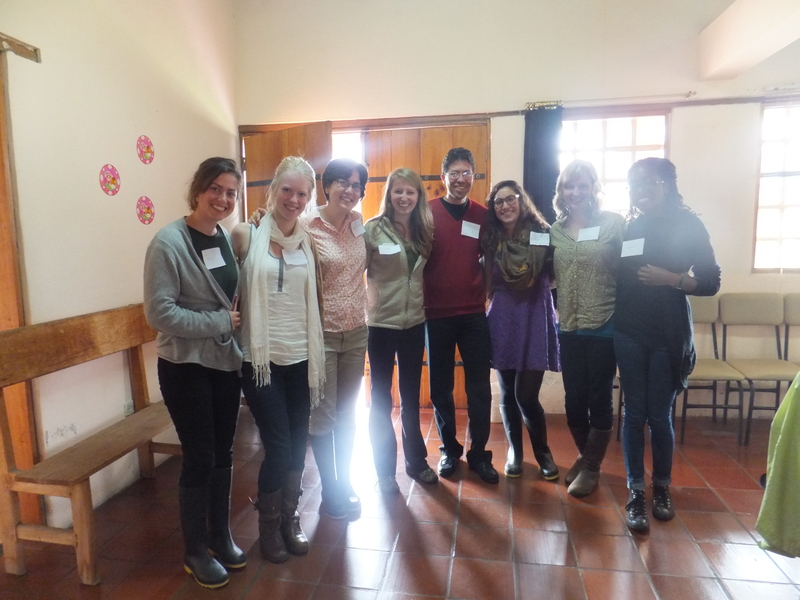 EIL also helped SIT with the homestay placements, so the Spanish classes sometimes incorporate specific interactions with the homestay families. The yellow bus gang is ready for our first day of school! On Monday, we were placed in our different classes; ours is the biggest class. We are seven girls sitting around our square table with Profe Vladimir at the white board at the front. School is in some extra classrooms of a state pre-school/childcare facility, so there is a picture of the pope and some holy crosses scattered throughout the room. The general class layout is a two hour segment of grammar, followed by an hour and a half of cultural learning, then a final hour of vocabulary and slang. We have breaks between each section and chow down some snacks brought by the EIL program, usually typical Ecuadorian food. For instance, on Monday, we went over the subjunctive and conditional tenses, ate an Ecuadorian bread-wrapped-in-a-leaf snack called quimbolitos, read about the Incan history of the Valley of Los Chillos, then learned about the history of Ecuadorian slang and its connection to Kichwa, the language of the Incans. On Wednesday, after learning about connecting words in the morning, we watched an Ecuadorian movie named “Qué tan lejos” about the journey of an Ecuadorian girl to get to Cuenca and break up a wedding. Throughout the whole movie, we were asked to write down Ecuadorian slang and our profe paused it every once in a while to make sure we were clear on what was happening. He also paused at points to talk about the Ecuadorian landscapes we were seeing and the different cultural aspects, such as the music, and political connections with the roadblock. We finished the day off with a game: each person chooses a Hispanic character, writes it on a piece of paper, and tapes it to their neighbor’s head. Everyone then has to ask questions to determine who they are. The best part was that our profe, the only guy in the room, was the only female character: Dora la Exploradora. We also have special days that provide a different type of learning. 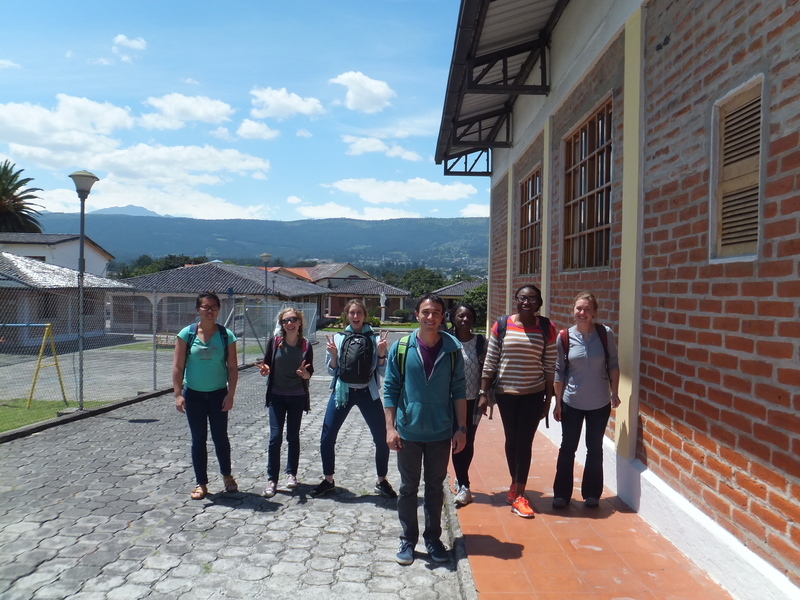 On Thursday, we had a mini learning excursion into a nearby town, Sangolquí. 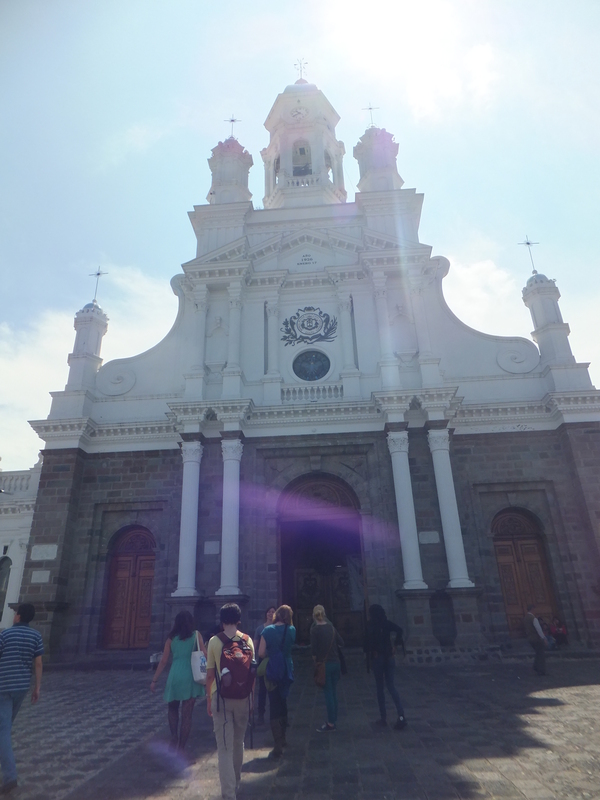 We went to the church in the center plaza, where our professor told us about how the Spaniards used the Catholic church, from the architecture of the actual building to the masses and ceremonies held inside, to assert their control over indigenous Ecuadorians. Afterward, we went to the town park and library, where we read a bit about the history of the town and checked out the library. Sangolquí is a small town, much like Ashland, Virginia. However, its library is one floor of a tiny building with about 5 small bookshelves, 3 computers, and a stack of newspapers. Our profe was explaining that reading is not a popular activity among any age group, which is reflected in this library. 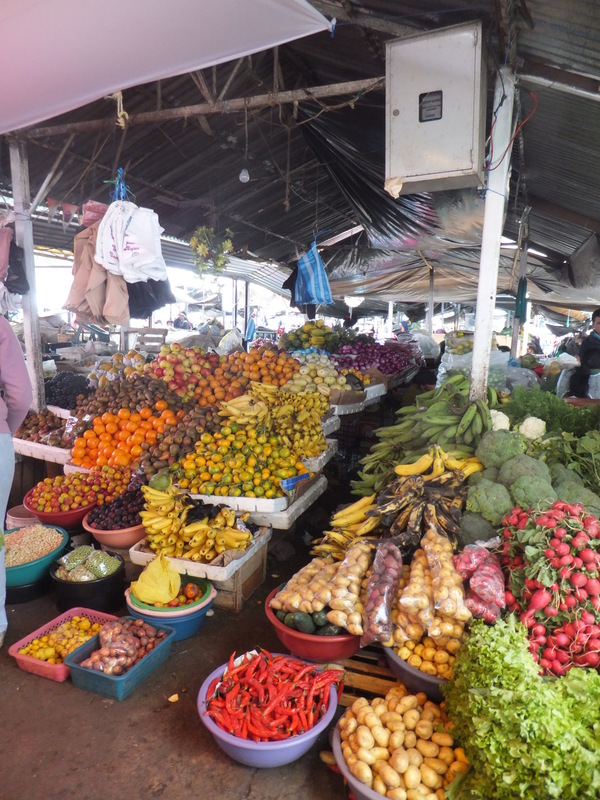 We then went to the town market, where we spoke with some of the vendors about their sales, which have gone down significantly with the installment of a Wal-mart brand supermarket, MegaMaxi. We also have had a couple academic seminars during this week. We have a 20 Questions activity that we have to complete throughout the semester. It is an opportunity for cross-cultural learning, with questions from “How much importance do people place on appearances?” to “What does it mean to be a part of a family?” and “How can you ascertain the importance of God in people’s lives?” There are four parts to the assignment: the first part is observations of how people naturally behave, followed by explanations of why this might be the case. The hard part is that we then have to talk with two or more people about what they think of our observations and explanations, but without simply asking them the question. The final section is reflections, in which we discuss how willing people were to actually converse on the subject and how the culture ties into the question and answers. At first, I really felt this was a silly assignment, it seemed we could learn more simply observing and that the conversations would be uncomfortable. However, I have realized that the assignment leads to an essential learning and very informative conversations. People are generally very willing to talk about the question, they are often interested to know what I think and sometimes see an aspect of their own culture for the first time. This program ensures that we are always learning. From waking up and insisting that I do not need to eat three pieces of bread with ham and egg along with my fruit and smoothie for breakfast, to navigating my way back home in the evening and attempting to discuss the day around the dinner table, Spanish class is the least learning of it all! More than just taking in information, we’re forced to analyze and use it every single day. I have to remember that my profe said that we do not throw things in Ecuador because it’s seen as rude, as well as the warning we received during a 20 Questions Seminar about lending things because you might not see them again. This entry was posted on Monday, February 25th, 2013 at 10:34 pm and is filed under Blair in Ecuador, Spring 2013. You can follow any responses to this entry through the RSS 2.0 feed. You can leave a response, or trackback from your own site.